A condition that doctors used to only see in factory workers is becoming more widespread. The pain that comes from the repetitive movements of texting has been dubbed "smartphone thumb" by doctors. It's actually tendinitis, when the tendon that bends and flexes the thumb becomes inflamed. More and more people are complaining about this type of pain in their thumb each year, say doctors at the Mayo Clinic. "My phone is a huge part of my life," Scott Seehusen told CBS Minnesota recently as he sat alone with his smartphone at a picnic table by Lake Calhoun, in Minneapolis. "I do everything from texting to emails, social media. Everything," he said. 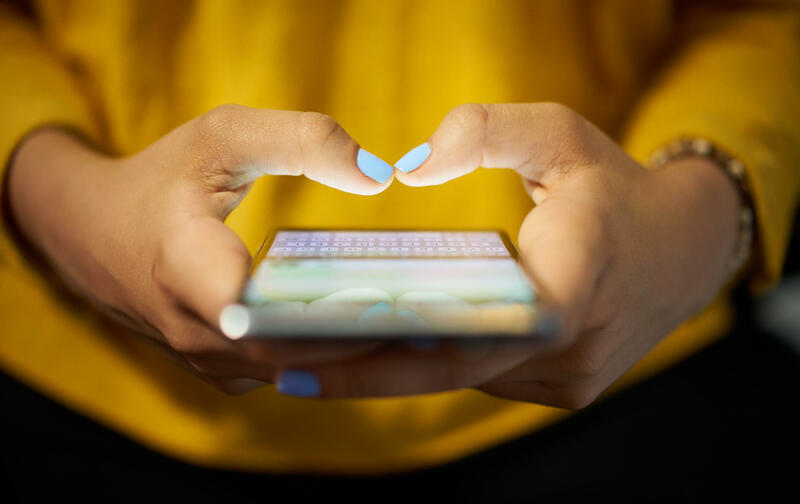 Dr. Kristin Zhao, a biomedical engineer at the Mayo Clinic in Rochester, Minnesota, explained what might be happening inside the hand to cause "smartphone thumb." "One of the hypotheses is that the joints get loose and lax, and because of that, the bones kind of move differently than they would in a normal situation," said Zhao. Zhao and a team of colleagues have been studying "smartphone thumb" for the last seven years. She says the movements we require our thumbs to make as we hold our phones are awkward. "It's also a movement that requires some force through the thumbs. So when you press on your phone, you know, you're interacting with your phone. It's not just free movement in space," she said. Mayo Clinic researchers began using a dynamic imaging technique in 2010 to watch the bones of a healthy patient move so they could document what's normal and compare it with what's not. "Our hypothesis is that abnormal motion of bones in the thumb could be causing pain onset and eventual osteoarthritis," Zhao said. Could too much texting lead to more cases of arthritis in the thumb? Zhao says maybe. "There is a high incidence of osteoarthritis in the thumb, and we just want to make sure we aren't encouraging that onset by our daily activities," she said. Another concern the researchers want to address is the impact of so much thumb movement on children. What it will mean for them later in life is unknown. "We really don't understand why adults get pain, and so children, if you start earlier, you may get pain younger," she said. To prevent problems, start by giving your thumbs a break, doctors say. Mix up your method by using your forefinger to peck the screen, or use your voice to dictate a message. You can also perform daily stretching exercises with your wrists and fingers to keep your tendons limber. Think about wow often you're using your joints and how often you are resting them, advises Zhao. "Are we taking periodic rests, or are we just exposing continually over the course of the day?" she asked. It could be a tough habit to break, though. Frequent texter Samantha Alsadi, who was walking her dog and using her phone at the same lake where CBS Minnesota found Seehusen, said, "I don't know if it will change people's, like, habits or addiction to their phone, but it's nice to know that we're already thinking ahead about that." The Mayo Clinic study is ongoing, and researchers have not yet reached any conclusions. But what doctors do already know about osteoarthritis in the thumb is that it occurs more in women than men.